If you're wondering how to write song lyrics, here's a tip that will allow you to tap into the emotion of the event or idea you're talking about in your song. When you want to write some lyrics, build a picture in your mind of the event/idea you want to write about. Do not begin writing until you are actually feeling the emotion and mood from this particular event. Once you are actually living the event in your mind, you are ready to begin writing.From this point you will be much more effective at communicating the ideas and mood from this event or idea. Many people believe that lyrics are simply a few words cleverly arranged to bring about an emotional reaction from a listener. The point of lyrics is to COMMUNICATE an idea or event. And the reason people have an emotional reaction to the words is because it triggers a memory within them (whether a past memory or "made up") that has some emotion attached to it. For example, if you were describing the pain you went through after breaking up with a loved one, and someone who went through a similar situation heard the lyrics, it would trigger this past event in their mind (whether it consciously or unconsciously).Because they have emotion attached to these memories, they will feel emotion as they hear your message. If you communicated this idea well enough you would be sure to bring about a reaction in someone who has fantasized about having a romance of this kind. The main idea is to COMMUNICATE your ideas/experiences through your lyrics. And as mentioned earlier, a great way to do this is to relive the situation in your mind and once again feel that emotion. From this point, write completely unedited and your words will flow, and most importantly communicate what you're trying to get across. If you remember from tip 4 in this series, I mentioned three of the most powerful human emotions. If you choose to write lyrics that appeal to these emotions, you will be sure to arouse powerful emotion in your listeners. 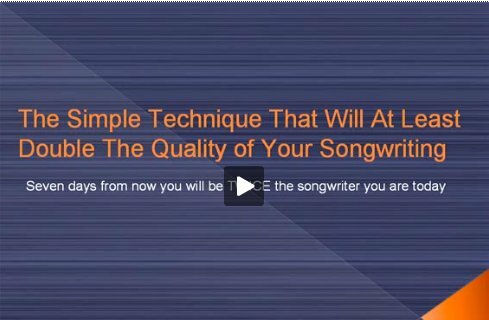 Here's another article that gives you another powerful tip about how to write song lyrics.